Preserving the memory of "the novelist of men at work"
Synopsis: Jim and Jill Manning are enjoying a cosy, bourgeois existence in rural Sussex. After their charwoman’s husband is killed in a hit-and-run accident, Jim suspects that the driver of the car was Bill Bule, a local aristocrat and friend of the Mannings. Jim confronts Bule and accuses him of having been responsible for the accident but he denies the charge. Jill subsequently confesses that not only was she driving the car but that she has also been having an affair with Bule for months. The three principals decide to sit tight and hush the whole thing up. But when the village bobby (who also happens to be the brother-in-law of the deceased) starts tenaciously investigating the case, the Mannings are forced to confront all manner of unpleasant truths about their relationship. Click here for a more detailed synopsis but please beware of plot spoilers! 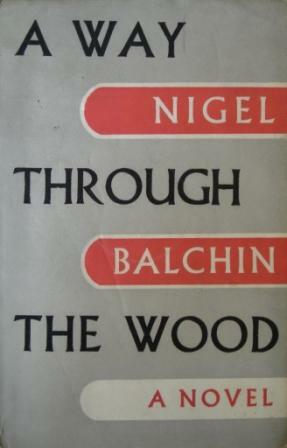 Context: The break-up of Balchin’s first marriage (his divorce came through three months before the book was published) hangs over A Way Through the Wood like a black cloud. The police-procedural aspect of the story derives from a play called The Highway Code that Balchin wrote in the 1930s. Verdict: A Way Through the Wood gets off to a very good start but the high quality is unfortunately not maintained. In particular, the middle of the book sags as the Mannings travel around Europe trying to salvage their marriage. Balchin is almost able to claw things back by virtue of one of his characteristically enthralling endings, but not quite. Availability: Was reissued on 10 March 2016 as a Weidenfeld & Nicolson Modern Classic.